What is a Vibrational Raindrop Technique? 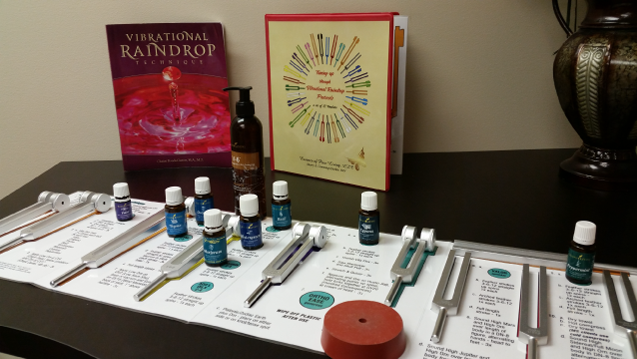 The Vibrational Raindrop Technique, brings together the power of vibrational frequency from Tuning Forks and the healing energetic frequency of Therapeutic Grade Essential Oils. Acutonics has been studied and used in vibrational healing for many years. In her research, Dr. Christi Bonds has discovered and created a powerful energetic and balancing tool for the body. A Raindrop Technique, is a sequence of anointing the body with oils and laying hands on the body that enables structural and electrical alignment in a relaxing and invigorating manner through the power of essential oils. There are many versions of a Raindrop Technique, and the oils that are used in a session can vary. How does the Vibrational Raindrop Technique work? 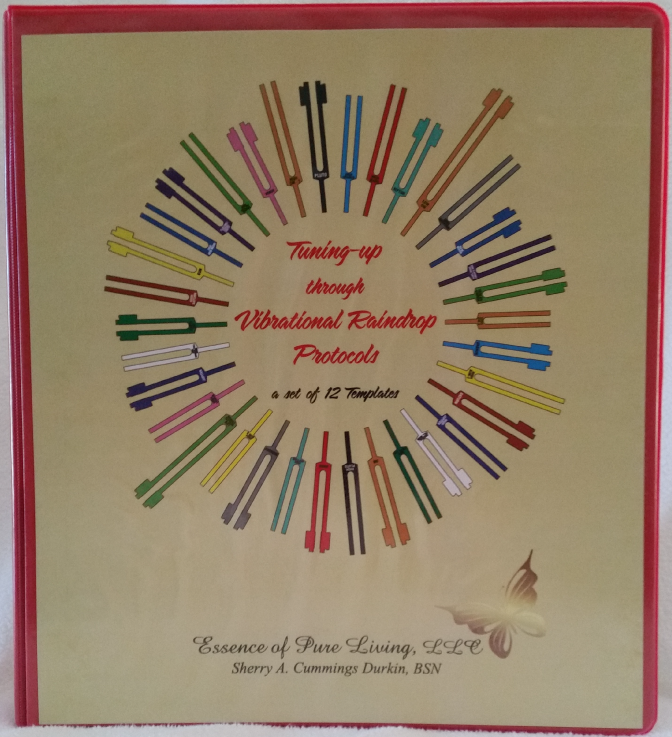 The Tuning Forks are paired to create ‘intervals’ of sound, starting with the Unison forks (two forks of identical frequency) and moving along to the 2nd, 3rd, 4th, 5th, 6th, 7th and Octave positions. 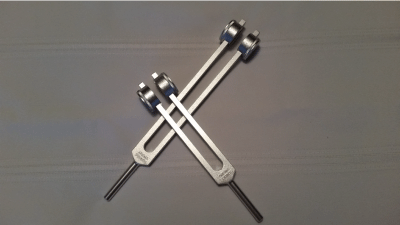 A Raindrop Technique with Tuning Forks always incorporates two tuning forks at the same time to produce harmonic musical intervals. Each interval has a related frequency and specific qualities that are combined with complementary essential oils at each part of the session. All of this is based on the Earth's rotation using mathematical equations and frequencies, as well as other planetary rotations and their varying frequencies. This correlates beautifully to the musical scales of the piano, familiar to you as maybe…do, re, mi, fa, so, la, ti, do. 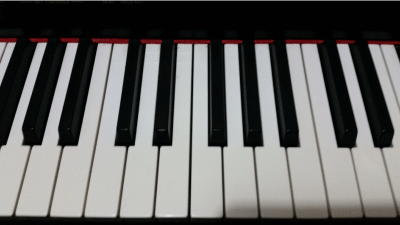 For example, when playing Middle C on the piano, it vibrates at 261.63Hz, while an octave lower vibrates at half that rate or 130.82Hz, thus a 2:1 ratio of frequency. An Interval is the sound created when 2 tones or pitches are sounded at the same time, or two tuning forks are tapped at the same time…the meeting of the two waves of these two tones. Some intervals are naturally pleasing to us: the Octave, 5ths, 4ths…”perfect intervals.” There is much more to the theory, including consonant, dissonant, and overtone aspects that bring the session into a deep and amazing healing place. But the idea of SOUND, as an energy form, measured in amplitudes and cycles per second, as frequency, can be measured….and this relates directly to our everyday lives. Some research and study of Sound Theory! Dr. Hans Jenny discovered that each organ of the body makes sound at specific frequencies, not heard by the human ear, but measurable nonetheless. Dr. Peter Manners, assisted with this and noted that diseased organs stopped emitting their specific key note. However, he discovered that once the diseased organ's key note was aimed at it, it was restored to health through resonance with a healthy frequency. Jonathan Goldman, musician and respected sound healer, states Frequency + Intention = Healing. Bruce Tainio of Washington has studied the frequencies of people in various states of health, various foods, herbs, and some essential oils. He discovered 1. that boxed and canned foods have NO MHz of energy to offer us, 2. that essential oils can amplify the energetic desire and intention for healing, and also raise the healthy frequency needed for healing, and 3. that our thoughts can increase or decrease the frequency in our bodies and prayer increases the frequency by 15 MHz. Dr. Royal Rife, discovered that each organ of the body makes sound at specific frequencies, not heard by the human ear, but measurable nonetheless. Dr. Masaru Emoto, a Japanese scientist discovered that molecules of water are affected by our thoughts, words, and feelings. What Vibrational Raindrop Technique protocols are available by Essence of Pure Living? All oils used in these sessions are therapeutic grade Young Living Essential Oils. Rest assured that you are getting the best best quality! Want to join Young Living—ask me how! To learn specifics about each oil listed below, you can purchase great resources, available from Life Science Publishing. 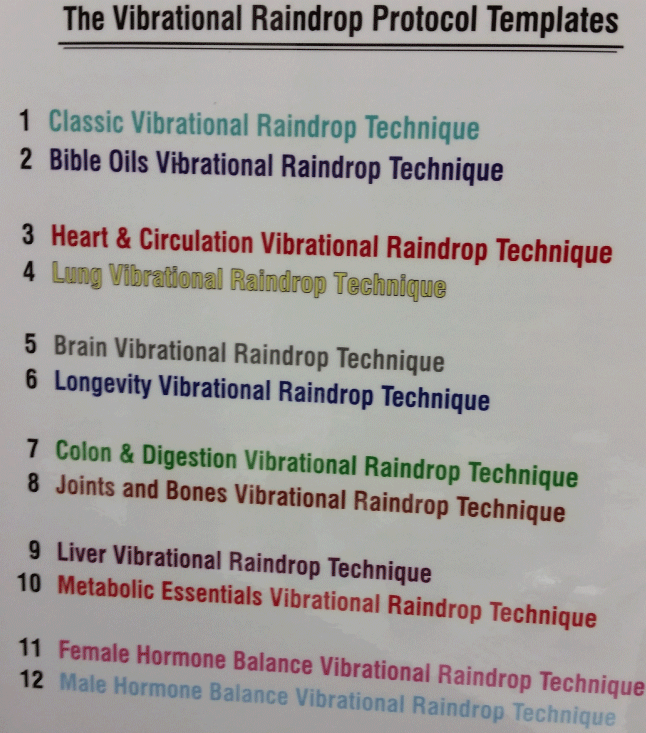 PRICES: Vibrational Raindrop Sessions see below. Want to practice VRT with ease and not smudge your Vibrational Raindrop Technique book or Handbook? Order Tuning Up through Vibrational Raindrop Protocols, a set of 12 templates by Sherry Cummings Durkin. 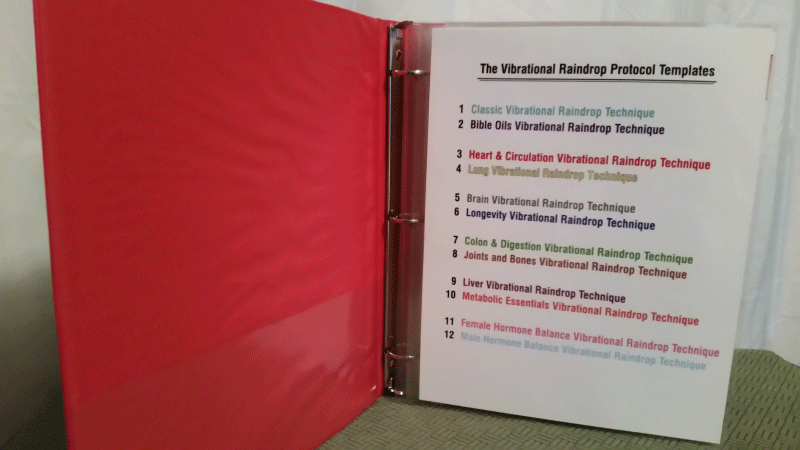 This binder includes laminated sheets of ALL 12 VRT protocols, color-coded and laid out with simple but complete instructions for ease and flow of giving any VRT session! To order: 1. Go to bottom of page to order through PayPal. 2. Call 814-883-0006 and place your order by phone. Shipping is added to cost of Binder, which is $120.00. Discounts: 1. Order 3 or more: $10.00 discount per Binder. 2. VRT Instructors please call for your pricing.